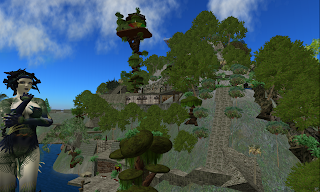 I blogged about Svarga a few days ago, and it seems I should also mention Lauk's Nest, another creation by Laukosargas Svarog. 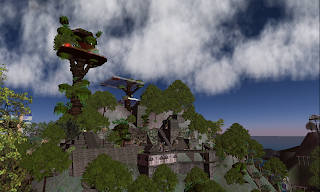 While Svarga was intended to be a public space, Lauk's Nest was her home, built in the style of an ancient Mayan ruin—a smaller area (not an entire sim) overlooking waterways and reaching out to the northern sim of Orwood, where I gather Laukosargas's creation Orwood Castle once stood. But unlike Svarga, Lauk's Nest has changed hands many times, and the original Mayan ruins are now buried under a sea of modern muck, some added with the best of intentions. A new owner, Eliana Zaytsev, now runs Lauk's Nest, and she's not only keenly aware of the region's historic importance, but also wants to move forward carefully with any changes. I suggested to her that she could even conduct something of an archaeological dig, clearing away the debris of the past few years!